At the invitation of Harbin Engineering University, Chairman Wang, together with the BUPT delegation,joined the 6th International Forum for University Presidents on ICT Education. On behalf of BUPT, Chairman Wang took the flag from President LIU Zhigang from Harbin Engineering University. Also attending the forum are ex-president of BUPT, professor LIN Jintong, director of International Office, Ms REN Chunxia, dean of University Anniversary Preparation Office, Ms LIN Zhiqing, and dean of Academic Affairs Office, Ms WANG Weining. In the flag handover ceremony, our chairman WANG made remarks pointing out the overwhelming importance of ICT industry. On the sidelines of the ceremony, Chairman WANG made sincerely invitation for everyone present to come to our 10th anniversary of BUPT in Oct. 2015, and join the next forum discussing the plans and strategies for ICT education. The International Forum for University Presidents on ICT Education was firstly initiated in 2005 by BUPT in Beijing, UEC in Tokyo, ICU in Seoul, ENST in Bretagne and DTF in Leipzig. The first five forums are held respectively by BUPT, ICU, The United Arab Emirates Advanced Tech Institution, St. Petersburg National Communication University and XIDIAN University. The major motivation for hosting the forum is to enhance the role of ICT education in universities and higher institutions, share and exchange the latest updates in the field, and provide a platform for the ICT universities across the whole world. The forum enjoys great reputation throughout the world and makes great contributions for the international cooperation and exchange in ICT education. The interaction part is hosted by professor LIN Jintong. We held the first International Forum for University Presidents on ICT Education in BUPT in 2005 as part of the 50th anniversary. 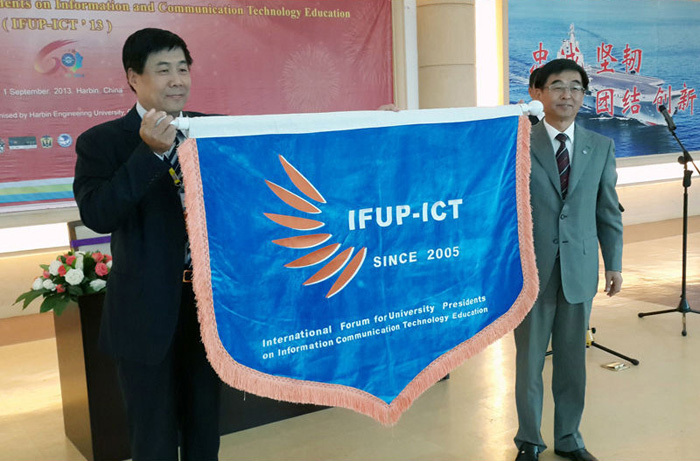 Ten years later in 2015, we will host the 7thInternational Forum for University Presidents on ICT Education (IFUP-ICT 2015) as part of our celebration for the 60th anniversary. Thanks for your attention.